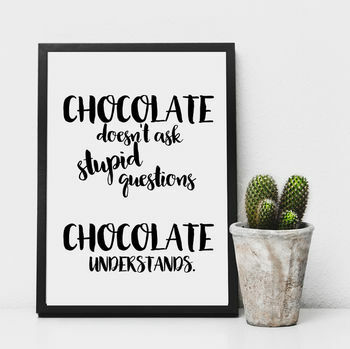 'Chocolate does not ask stupid questions...chocolate understands' text in a modern font on a white background. A contemporary print with a sense of humour for any home or chocoholic! The print is ideal as a funy birthday gift for a friend or relative. Perfect for those chocolate lovers!